Regulators in the U.S. and EU plan tougher emissions tests in the wake of the VW cheating scandal. LONDON (Reuters) -- Automobile emissions-control system makers such as Johnson Matthey and France's Faurecia are set to gain more from the chaos engulfing Volkswagen after its diesel emissions tests scandal, investors say. Europe's largest carmaker needs to fix up to 11 million vehicles, and the scandal is likely to lead to tighter regulation for the sector as a whole -- in the United States as well as Europe. All of this can only benefit makers of emissions control systems, whose shares have climbed 15 to 27 percent since late September -- contrasting with the 40 percent fall in Volkswagen itself as the scale of the scandal emerged last month. The carmaker has admitted cheating in diesel emissions tests in the United States and says its cars in markets all the way to Australia are also affected. Germany says the company also manipulated tests in Europe, where it sells about 40 percent of its vehicles. 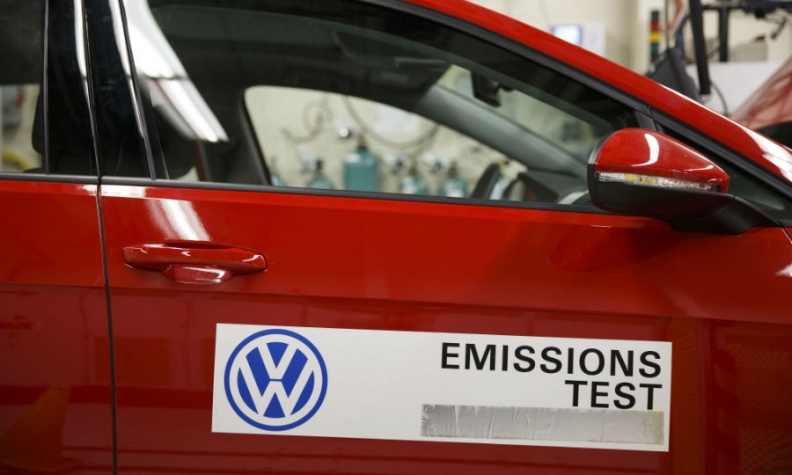 "The Volkswagen issue could have a silver lining for some auto component companies as they would be selling more sophisticated emissions control equipment to carmakers," said David Battersby, investment manager at Redmayne-Bentley. "Johnson Matthey provides such an opportunity. We increased our exposure to the stock this week and are looking to buy more in the coming days." An Italian broker said the scandal would require additional emission technologies and companies such as Johnson Matthey, Germany's ElringKlinger, France's Valeo and Faurecia and Belgian group Umicore had the right skills to benefit in the long term. Analysts say shares in these firms are likely to keep climbing even after their surge since late last month. The European auto index, which had lost 20 percent from mid- to late September, has since rebounded 14 percent. HSBC, which has a "buy" rating on Johnson Matthey and Faurecia, said in a note that the scandal and moves towards 'real-world driving emissions' (RDE) testing were largely positive for auto catalyst makers as the new legislation would force carmakers to use new and more powerful catalytic systems. The European Commission wants to tighten vehicle testing. Its officials recently met to try to end a stalemate over plans to introduce RDE tests for nitrogen oxide (NOx) emissions rather than rely on easily manipulated lab tests. The new NOx testing is due to begin early next year. "Emission norms are getting more stringent and that's good for the companies involved in manufacturing emission-control equipment," Didier Duret, global chief investment officer at ABN-AMRO Private Banking, said. "The Volkswagen issue has further brightened their prospects." Falling prices of platinum, a key part of some catalytic converters, were also expected to improve the profit margins of the companies, analysts said. Platinum prices have slumped 33 percent over the last 15 months due to abundant supplies, lackluster demand and concern that interest in diesel cars, which mainly use platinum in their catalytic converters, may be hurt in the wake of the Volkswagen scandal. But Greg Archer, a consultant for the Transport & Environment Group, was quoted by HSBC in a report as saying that diesel will not disappear from Europe due to the advantages of diesel engines in fuel efficiency, lower carbon emissions and strength in certain areas such as commercial vehicles. Credit Suisse has raised its target price for materials technology and recycling group Umicore to 45 euros ($51) from 43 euros with an "outperform" rating. Thomson Reuters data showed all 13 analysts who contributed to the database had ratings from "hold" to "strong buy" on the stock. None had a "sell" recommendation. "We were already broadly positive on auto-part makers as they tend to have more innovations than vehicle manufacturers," Ronny Claeys, senior strategist at KBC Asset Management in Brussels, said. "The Volkswagen scandal makes these suppliers even more attractive because they are the ones which have to provide solutions and therefore would be able to demand higher prices."